The Yogi Berra leaving Battery Park City. Goldman Sachs pays to have ferry runs 16 hours a day. Goldman Sachs, which has certainly borne its share of public anger about the financial crisis, is now drawing heat for another reason: noisy ferryboats. The boats, which have been running almost constantly across the Hudson River every weekday since Goldman moved into its new headquarters in Battery Park City, have generated frequent complaints from residents of the neighborhood. Goldman does not own the offending boats, but it is paying a ferry company to keep them running 16 hours a day between a floating terminal at the edge of Battery Park City and a dock near Goldman’s waterfront office tower in Jersey City. The dispute about the boat noise has droned on for so long that Battery Park City officials have hinted that they might want to give the Port Authority of New York and New Jersey, which owns the $50 million floating terminal, the heave-ho, saying the agency is violating the terms of its lease with the high noise levels. In a letter he drafted to the Port Authority recently, James E. Cavanaugh, the president of the Battery Park City Authority, demanded an end to the “unreasonable noise” emanating from what he called the Goldman service. Now, having fielded complaints for eight months, Goldman is preparing to solve the problem with its wallet. The firm is having two ferryboats built to its specifications at an estimated cost of more than $5 million, said people with knowledge of the firm’s plan who insisted on anonymity because they did not have permission to discuss it. The two boats, which would be more luxurious than the typical commuter ferry on the Hudson, could arrive before the end of the year, these people said. Goldman intends to substitute the new vessels for the NY Waterway boats that have been plying the short route between its office towers on opposite sides of the river. Mr. Cavanaugh said he hoped that the matter could be resolved without legal action, but he did not rule out the possibility of litigation. The draft letter he sent to the Port Authority said the “Goldman service” had “unreasonably inconvenienced and annoyed” some residents of Battery Park City. It alluded to noise readings taken by the city’s Department of Environmental Protection in April and May that exceeded the city’s legal limit of 10 decibels above the ambient noise level. Mr. Cavanaugh blamed the problem on the use of older, noisier boats since Goldman increased the frequency of ferry runs — to every seven or eight minutes — when its employees began moving into the new tower late last year. The ferries run from 6 a.m. to almost 10 p.m. The terminal is operated for the Port Authority by a ferry company known as BillyBey, which is named after its owner, William Wachtel, a politically active Manhattan lawyer. 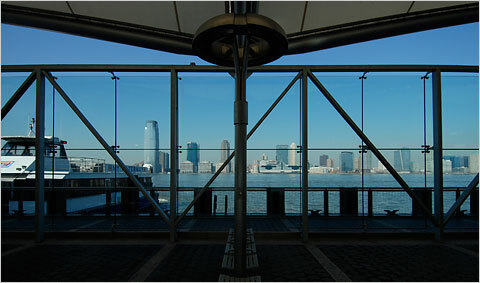 Goldman Sachs, in turn, pays BillyBey to run boats between the terminal and the Jersey City dock, known as Paulus Hook. The boats, which fly the NY Waterway commuter-service flag, are open to the public for a fare of $5.50 each way. But community leaders in Battery Park City say that, outside of the morning and evening rush hours, the ferries serve primarily as shuttles for Goldman employees. 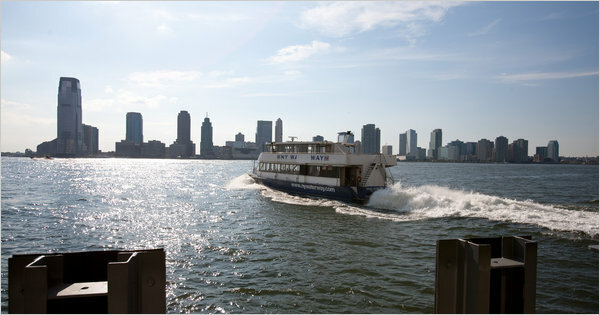 Indeed, they run far more frequently than other commuter ferries do: NY Waterway boats run as infrequently as twice an hour in the middle of the day between the train terminal in Hoboken, N.J., and Battery Park City. Privately, some Goldman officials bridle at the complaints, suggesting that the neighbors were piling criticism on a firm that has already been faulted in the public eye. They declined to discuss the firm’s plan to obtain its own boats. But, in a statement, the firm said it had contracted with BillyBey “to provide the most efficient form of transportation for our employees to shuttle between our two buildings, while also providing a public service.” It added that the firm was “aware there have been some issues raised” and was working with the ferry operator to explore all options to address them. A spokesman for BillyBey said the company had switched to newer, quieter boats after the complaints first arose late last year and had not received any complaints since then. But Mr. Cavanaugh said he had seen the older boats — nicknamed the Italian class because they were named after famous Italian-Americans like Frank Sinatra and Yogi Berra — operating on the route recently and had heard about other sightings by residents of Battery Park City. Like many businesses and many families in these difficult times, NY Waterway faces serious challenges. Let me be absolutely clear on this: We certainly can and will find a way to continue serving you. Many political leaders throughout the region recognize the important service we provide. We carry about 25,000 people more or less to work and for leisure every day. Also, it is universally known the value our ferries provide in emergencies. We are the largest rescue fleet in the region, maintained at no cost to the taxpayers. When attacks on the World Trade Center knocked out PATH service in 1993 and on September 11, 2001, NY Waterway was there. We got you home, taking more than 150,000 people out of Manhattan on 9/11. When a blackout closed all the Hudson River rail and vehicle tunnels in 2003, we got you home, taking another 160,000 people out of Manhattan August 13, 2003. And when Flight 1549 crashed into the Hudson River on January 15, we were there, rescuing 142 passengers within minutes, rescuing them before they died of exposure in the icy waters. And hundreds of other emergency happenings related to PATH breakdowns, threatened strikes, weather interruptions, etc. etc. We will keep our ferries floating, to keep our 22-year commitment that we will always get you home-a commitment we love to keep! Years late and millions of dollars over its original budget, the floating Port Authority ferry terminal off the Battery Park City bulkhead is to greet its first commuters from Hoboken, N.J., shortly after 6 a.m. on Wednesday. Better late than never? Ferry passengers will be the ultimate judges, but an inspection tour on Tuesday revealed a substantial and grown-up transportation structure — unlike the tent that’s been pitched in Battery Park City’s backyard “temporarily” for 20 years — with the capacity to serve even those who aren’t bound for Weehawken, Paulus Hook, Belford or Yonkers. “This is public space, regardless of whether or not they’re riding a ferry boat,” said Paul Goodman, chief executive of BillyBey Ferry Company, which will operate and maintain the terminal under contract to the Port Authority of New York and New Jersey. 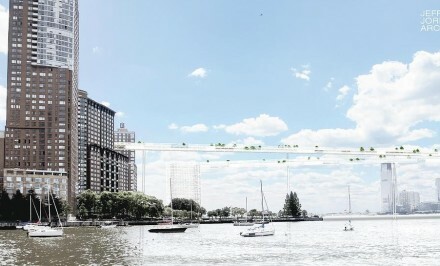 By “this,” he was referring to the outermost deck of the 160-by-176-foot hull, which is envisioned as an extension of the Battery Park City esplanade. About 7,000 to 8,000 passenger trips are expected daily through the terminal. (One commuter, going back and forth, would count as two trips.) Before 9/11 and the destruction of the World Trade Center nearby, the temporary terminal handled about twice as much traffic. The authority puts the “hard” construction budget at $50 million, with “soft” costs like fees and interest bringing the total to $91.5 million. The original construction award in 2004 was $35.7 million. At the time, the authority estimated that the terminal would be completed in 2006. As recently as last summer, when the hull was under construction in Brooklyn, it was hoped that it would be open in mid-year. But there were unanticipated construction complications involving the glass windscreens that wrap the passenger deck and gangways, among other issues. The terminal’s opening coincides with the news, reported in Crain’s New York Business on Sunday, that New York Waterway may go bankrupt this year. “The question is whether we can survive,” Arthur Imperatore Sr., the company’s chief executive, was quoted as saying in the article.